RVing can often be a game of weights, measurements, and balances. Rookie and seasoned RVers alike need to know the importance of their rig’s different size and weight dimensions to have a safe RVing experience. Knowing the difference between different weight types is especially confusing for new RVers who have to learn the difference and application of different weights such as curb weight, dry weight, and gross vehicle weight. One of our goals at the RV Travel section is to cut through the technical information and simplify RVing so that it doesn’t seem so mysterious for those thinking about buying their first rig. That’s why we want to focus on a topic that will crop up many times throughout the RV season, the RV’s curb weight. What is curb weight, and what does it have to do with RVs? Keep reading to learn what curb weight is, why it matters, and how to find your RV’s curb weight. Pro Tip: Refer to your RV’s instruction manual and manufacturer’s guidelines for the curb weight of your rig. 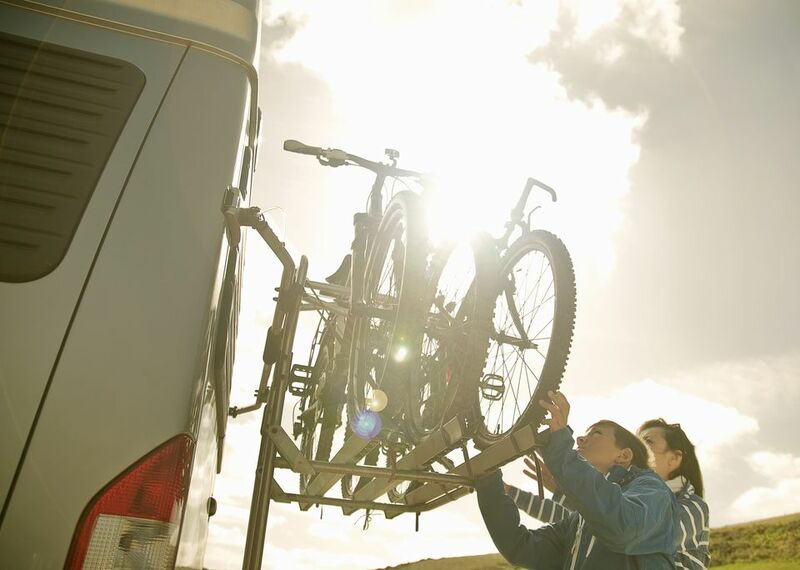 Ensure that your vehicle meets the towing capacity for your RV’s curb weight. As the name implies your curb or wet weight, includes the fluids in the vehicle such as liquid propane, fresh water, and full fuel tanks. Dry weight is the weight of the vehicle excluding these fuels and liquids, hence the terms dry and wet weight. Why is Curb Weight Important? It is important to know your RV’s curb weight for several different reasons. The curb weight of the vehicle can help determine the proper hitch class and size for your RV, it can help you determine if certain roads or bridges that have weight ratings are viable for your vehicle and it can also help determine the load your RV can handle when it is fully loaded and what type or cargo is acceptable to not weigh your ride down. Curb weight is also important to the RV manufacturer. They need to know the correct weight of the vehicle once it will be filled with fuel and fluids to make accurate engineering and building assessments. If the manufacturer only used dry weight to determine specifications, there would be immediate problems with the vehicle. How Do I Find My Curb Weight? Your RV owner’s manual should, but does not always contain the vehicle’s curb weight. If your manual does not or you have misplaced the manual, you can always call the RV manufacturer, let them know your model, and they should have the curb weight available for you. If you absolutely need to know your curb weight without consulting your manual or manufacturer, you can take the RV to a weigh station with full tanks. Not all weigh stations allow personal vehicles so make sure you will be allowed to use it for your RV. Curb weight is one of the many different weights to know to keep your RV efficient and safe. Keep a little notebook in your dash with your vehicle’s different weight readings to be ready whenever the information is necessary. What Is Tongue Weight and How Do You Measure It?